A long-established amateur dramatic group that has been performing at Westhoughton United Reformed Church (The Bethel) over many years, usually putting on two shows per year with a traditional Pantomime in January and a youth production during the summer, with performances running over a couple of weeks. Not only does the group provide an opportunity for local talent to try their hand at acting and performance, but it also provides opportunities in stage craft (design and building), as well as costume design and the technical aspects of putting on a show. There is a focus on youth and The Bethel Crowd has seen many a young performer gain confidence and experience and go on to do well at senior school, university and beyond. Youth productions are fun and rewarding for those involved, offering challenge, routine and a good sense of team-work, The shows come thick and fast, and offer plenty of opportunity to get involved whether acting or in support roles. 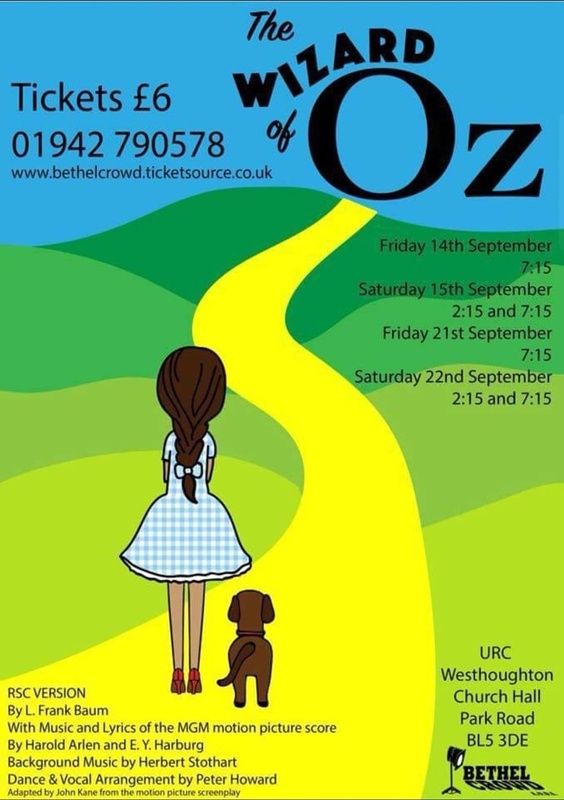 Whether the iconic Bugsy Malone, the school favourite The Dracula Spectacular or the classic Wizard of Oz, the shows are always of a high standard and well worth checking out. It costs £1 to audition; for those that get a part it costs £5 to become a member of the society. It cost a great deal to stage these shows - hire of hall, costumes, theatrical equipment, show licences… - so all support is welcome. But most of all local people coming to the shows and seeing the performances is what matters. There is an initial meeting for anyone interested in auditioning or being part of the production; followed shortly after an audition preparation evening for practice, pointers and tips for readings of parts prior to casting… before formal, open auditions usually on a Sunday afternoon. Audition pieces are uploaded to allow would-be cast members to prepare. New talent - the lifeblood of a successful drama society is always welcome and encouraged. Depending upon the production, the age range will be stated. Those under the age of 16 needing to bring a parent or guardian over 18 to the initial meeting. £1 audition fee. Auditions taking pace during the afternoon, with the possibility of same day callbacks. For those interested in the production side of theatre there will be opportunities to help out with important work behind the scenes. After all the preparation and rehearsals the latest panto production from The Bethel Crowd was the classic tale of 'Little Red Riding Hood'. Little girls running errands for granny and hungry and devious wolves running amok in the woods… Plenty of fun and audience participation; singing and dancing. This traditional pantomime is a fun evening out for all the family. Preparations soon to begin for the next Youth Theatre production - 'Hoodwinked' (The swashbuckling Robin Hood musical). Auditions: Sunday, 17th March (1pm); with initial meeting to find out more Wednesday, 13th March (7:15pm). Tickets for all shows available online through Ticket Source or order by calling 01942 790578 / 07877 763452. Throughout the year there are a number of social events and other productions: typically a Murder Mystery (May); Quiz Nights and the Bethel Crowd usually perform tasters at local community events over the summer. 'Death By Chocolate' - Murder Mystery. Saturday, 23rd March 2019 - 7:15pm. Fun evening trying to solve the crime. Bring own drinks and refreshments. 'Hoodwinked' - The Robin Hood Musical Casting is early in the year with rehearsals for the show in June (21st, 22nd, 28th and 29th). Watch out for taster performances over the summer at community events in Westhoughton. The 2018 autumn, show performed 14th/15th & 21st/22nd September, was the RSC version of the colourful, endearing and enduring classic 'The Wizard of Oz' as adapted from the film for the stage. The story of Kansas girl Dorothy dreaming of what lies over the rainbow. A storm and an epic journey of mystery, discovery and challenges as she is joined by a Scarecrow, a Tinman, and a Cowardly Lion as they search for Wizard who can help Dorothy get home. There are witches, Munchkins, yellow brick roads and of course, Toto the dog. Some great songs including: 'Over The Rainbow', 'Munchkinland (Ding Dong! The Witch Is Dead)', 'If I Only Had A Brain…', 'We’re Off To See The Wizard', and more. After all the hard work on stage and off, a fun and engaging show, drawing good audiences over its 2-week run, with some great performances. With open evenings and auditions taking place in July, followed by months of rehearsals in between other shows, the 2018 pantomime, 'Aladdin', which as well as all the fun and great songs you'd expect, saw the Bethel Crowd will be unveiling their new pantomime dame! This traditional pantomime, second in popularity only to 'Cinderella', is based on the 'Tales of the Arabian Nights', with the pantomime version set in China, and first performed in 1788. Featuring Aladdin, Wishee Washee and their mum Widow Twankey, and the villain Abanazar. 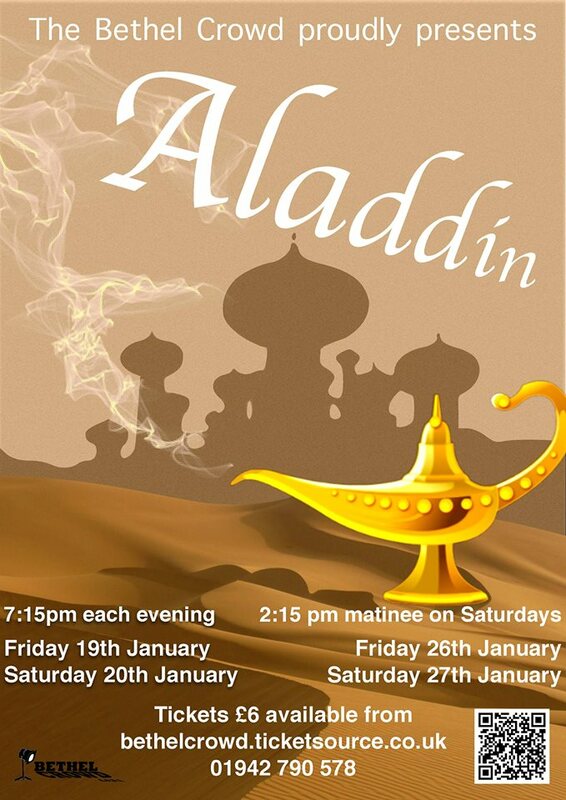 Full of magical numbers and hilarious jokes, this pantomime will be enjoyable for all ages. In the midst of preparations and rehearsals take place for the 2018 panto, the Bethel Crowd performed a Musical Review covering some of their favourite songs from over the years. The took place on Saturday, 16th September. 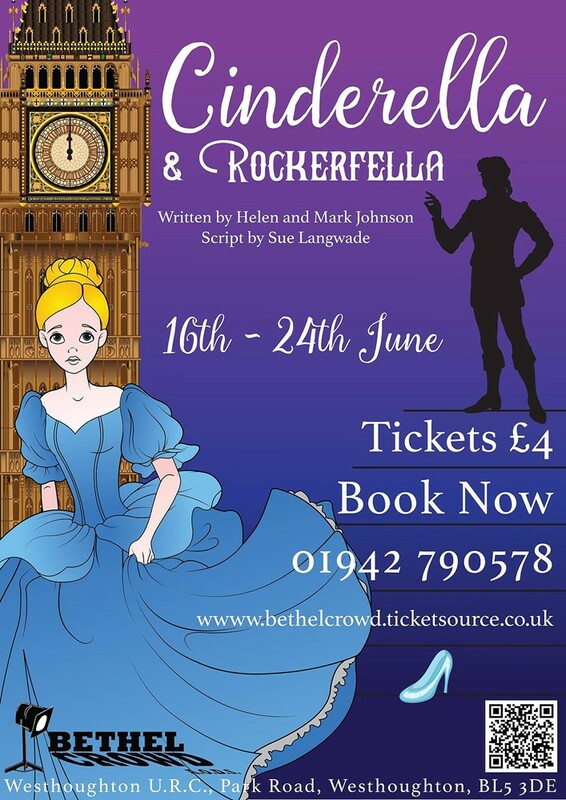 Hot on the heels of the Panto success, the Bethel Crowd Junior Workshop's turn to dazzle and impress with a new production of Cinderella & Rockerfella, written By: Sue Langwade, and Mark and Helen Johnson, and directed by Ben Kilburn. With performers aged between 8 and 18, a modern, panto-style reworking of the classic tale with all the traditional characters: downtrodden Cinderella, Rockerfella (formerly known as Prince Charming), Buttons, the Ugly Sisters and the Fairy Godmother, together with a selection of additional characters, from music managers and paparazzi to good and bad fairies - all placed in a world of fame and celebrity. The production took place Friday/Saturday 16th/17th and 23rd/24th June. With open auditions in June, then a programme of rehearsals, the January 2017 pantomime, directed by Ben Kilburn and choreographed by Helena Carter, took place the final and first weeks of January and February respectively. The story of an Ogre threatening the land; King Oliphant wanting rid, and newcomers Ralph and Puss, helped by mum Hermoine, and armed with some magic boots out to rid the land of this evil menace! 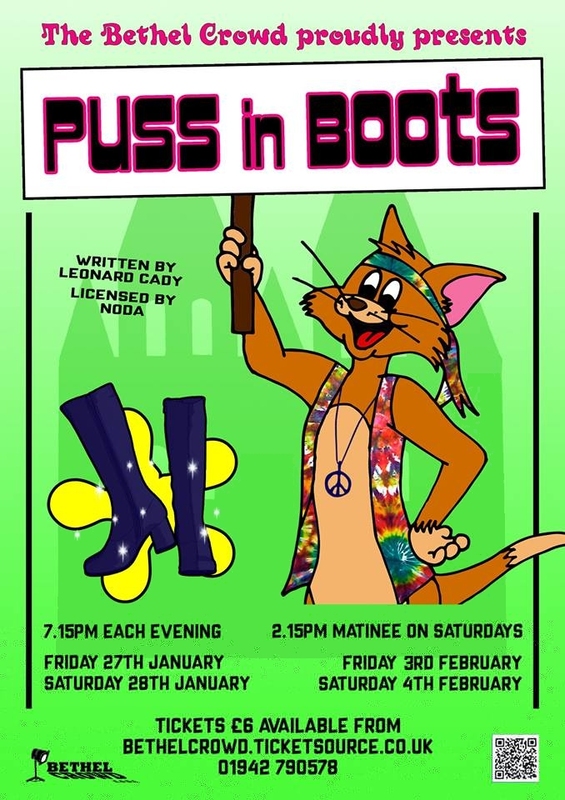 Puss in Boots, a very traditional pantomime full of laughs, excitement and song, and another success for the Bethel Crowd! After 26 years of playing the Dame, entertaining and making everyone laugh, it was Will Taylor's final performance. The Panto was preceded in December (10th) by a special performance of Silent Night - the audience discovering how a poem written by a parish priest resulted in the much-loved carol Silent Night. With an Austrian feel and a selection of well-known carols, this wonderful children's nativity combined humour, drama and festive traditions. 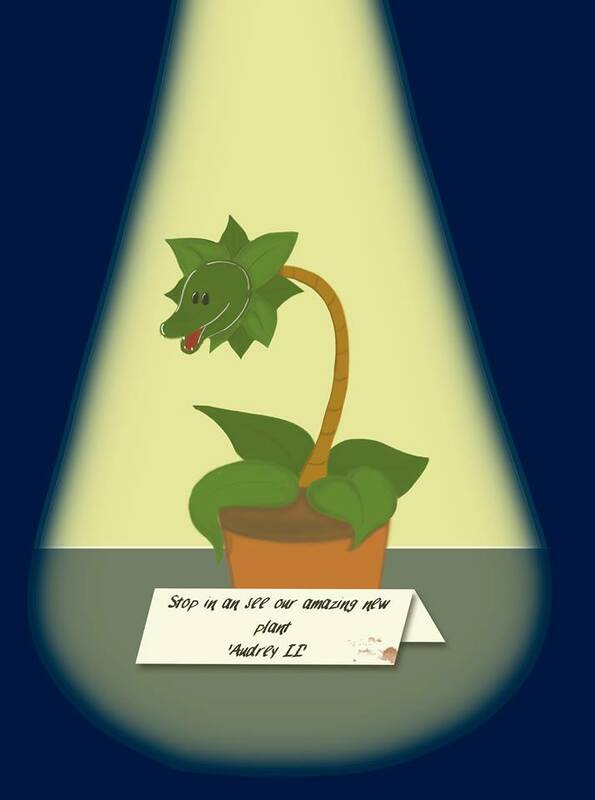 Taking place over two weekends in September 2016 , Little Shop of Horrors was a fun musical where a man-eating plant takes centre stage! Seymour, Audrey, Audrey II (the plant) and a maniac Dentist. Brought to life in a cult movie starring Rick Moranis and Steve Martin. It is a tale of love, magic and danger! With some great songs. 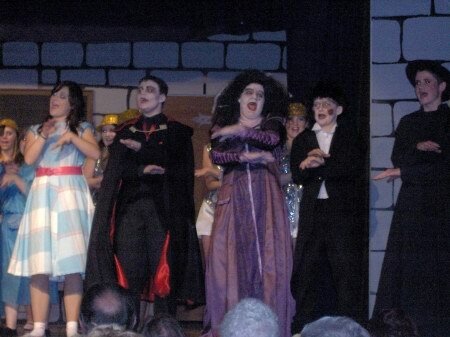 The cast were made up of actors 14 and above, who rehearsed over the summer months. In the summer the Bethel Crowd had the opportunity to try out the songs and perform on stage as part of the Westhoughton Yarn Bombing Festival in July. With an initial meeting and auditions early February (age range: 8 to 18. 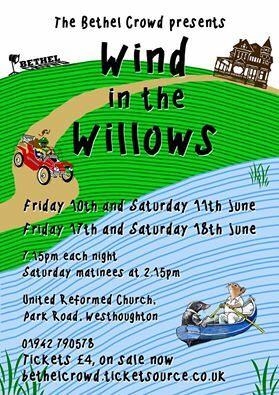 ), the Bethel Crowd's June production was the whimsical tale of 'Wind in The Willows' - a children’s musical with twelve songs, in two acts. Performances took place over the weekends of 10th & 11th; 17th & 18th June with Saturday matinees. A Murder Mystery evening took place on Saturday, 9th April (7:15pm). 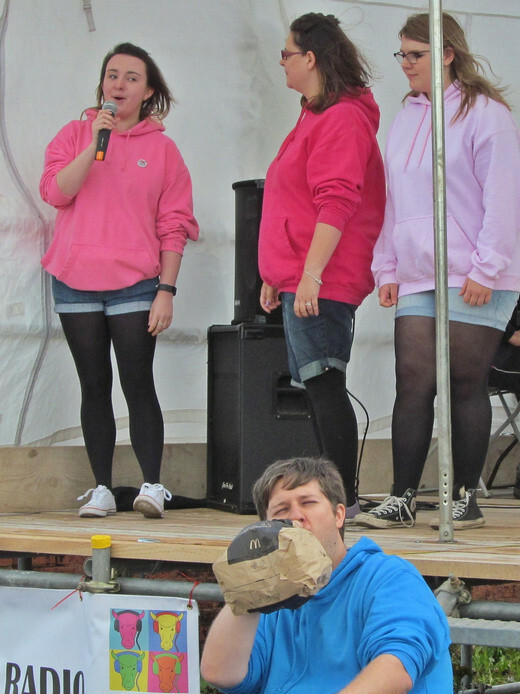 These events allow our actors some stage time, whilst providing some local entertainment, but are also important in helping to raise extra funds for our AODS group. After recent productions, the Bethel Crowd regrouped to prepare for the 2016 Panto. 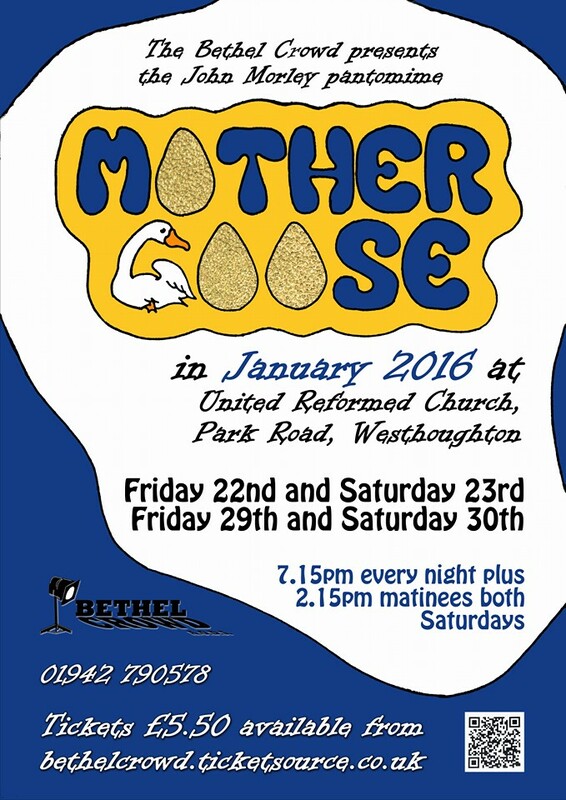 This year it was the ever-popular and hilariously funny Mother Goose; performances took place the weekends of Friday/Saturday, 22nd/23rd and 29th/30th January (7:15pm), with matinee performances on the Saturdays at 2:15pm. 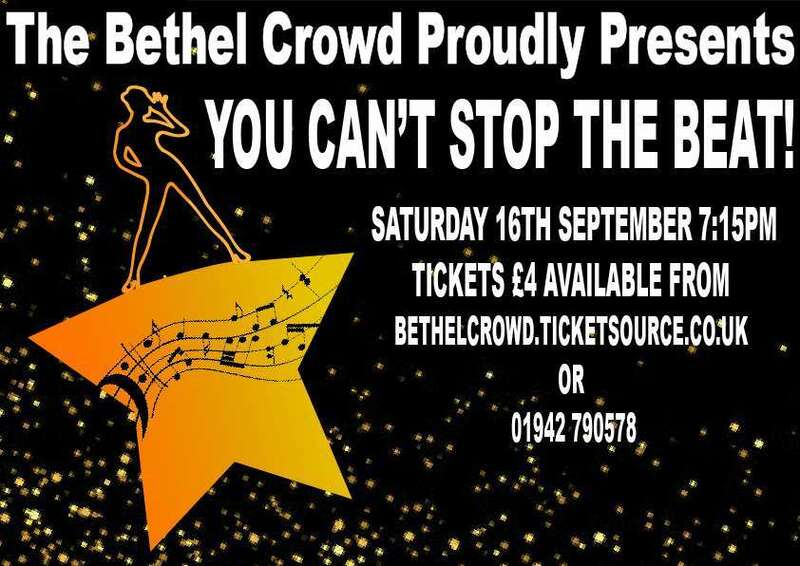 Tickets £5.50; available from the Bethel or online. Following auditions and readings for parts in April, The Bethel Crowd's Youth Theatre took on this much-loved musical as High School students Sandy, Danny, T-Birds and Pink Ladies reunite following the holidays with tales of summer romances and adventures. You'll be hopelessly devoted to this classic 1950s era, toe-tapping romp set at Rydell High. The production took place Friday/Saturday 18/19th and 25/26th with matinees on the Saturdays. Directed by Benjamin Kilburn, featuring the Bethel Crowd Junior Workshop (Ages 8-18), this popular, well-written 'James Bond' spoof has all the characters as fruits. The performances featured two stories as a double bill, with uplifting songs and plenty of humour. 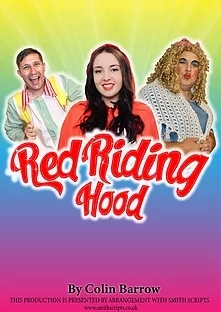 Initial cast meetings for Red Macintosh took place on Wednesday 18th February with auditions on Sunday 22nd February, followed by weekly rehearsals for the young cast, including some promising newcomers. Performances the weekends of 26th/27th June and 3rd/4th July, with Saturday matinees. Following on from the last Bethel Crowd production, Alice - The Musical, January means it is 'Panto Time!' for our local Thespians. Planning meetings and auditions took place in August with rehearsals taking place weekly - it is always good to see new faces coming through. Performances of the now familiar tale of Beauty and the Beast took place on the last two weekends of January with extra matinee performances on the Saturdays. As ever lots of fun moments, good and evil, audience participation, as well as music and enchantment. Tickets sold well, helped by the new online booking service. 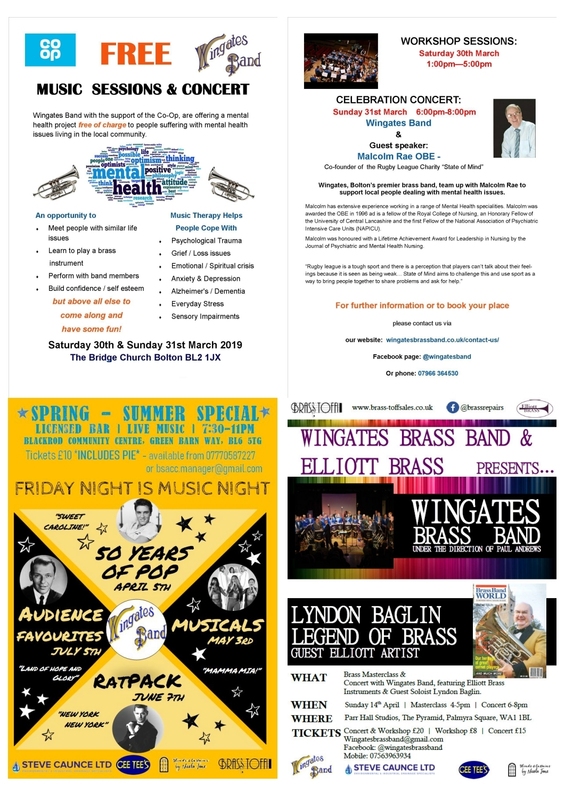 As well as the amateur dramatic performances, the Bethel also holds special events throughout the year to raise funds, showcase talent and have some community fun. Events such as the Bethel Crowd performing Murder Mystery evenings, Quiz nights… These are always evenings of fun that help keep the Bethel Crowd going. The Bethel Crowd Youth Theatre was relaunched by current chairperson, Susan Burchall, in 2001. It has steadily grown from strength to strength over recent years with several high quality productions. The workshop is currently being run by Ben Kilburn, who began as a member in 2001 for Bugsy Malone playing Fat Sam, and he has since gone on to do a degree in acting at University; he is busy in both acting and production roles supporting local theatre. Aiding him is local primary school teacher Lisa Coburn. The aim of the junior workshop is to give the younger generation (ages 8- 24) a chance to shine on the stage and prepare themselves to compete against older and more experienced performers. Each member is given the opportunity to work with an experienced director and learn more about acting as both a hobby or vocation. It is a great way to bolster up confidence or channel excess energy as well as being both fun and challenging. 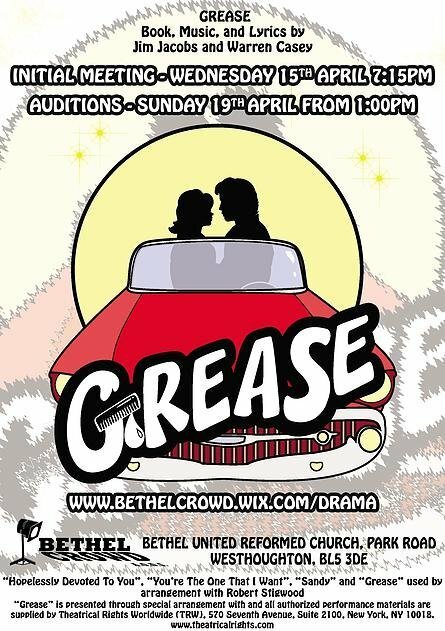 In the run up to productions, meetings and auditions open to all take place welcoming newcomers and regulars alike [Ages 8+] to see what The Bethel Crowd is all about. 2015 Beauty & The Beast! More information about the Bethel Crowd Junior Workshop at the Bethel Crowd website. Bethel Crowd videos on YouTube.